"Immediately before the travellers the widest of these glens opened like a long gulf among the hills. Far inward they glimpsed a tumbled mountain-mass with one tall peak..."
A mighty snow-clad peak that rose in the inner regions of the White Mountains. From its feet sprang the river Snowbourn, whose widening valley ran northwards through the mountains to emerge onto the plains of Rohan. 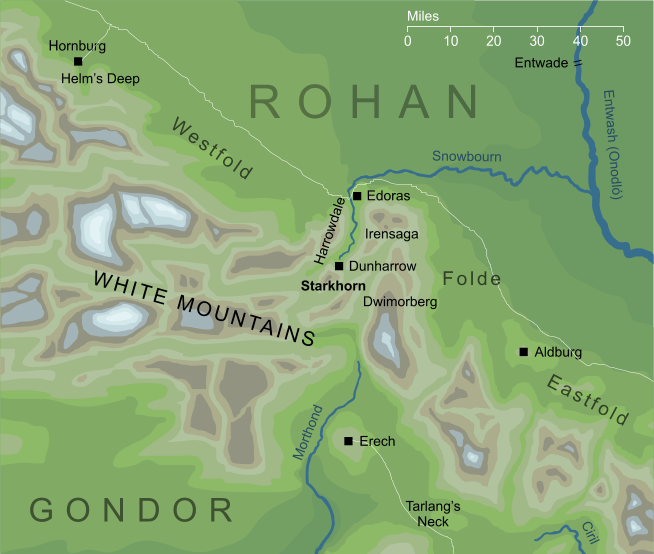 The Rohirrim called that valley Harrowdale, and built their courts of Edoras at its mouth, from where the lonely white peak of the Starkhorn could be seen along the straight length of the valley. Original content © copyright Mark Fisher 2002, 2019. All rights reserved. For conditions of reuse, see the Site FAQ.